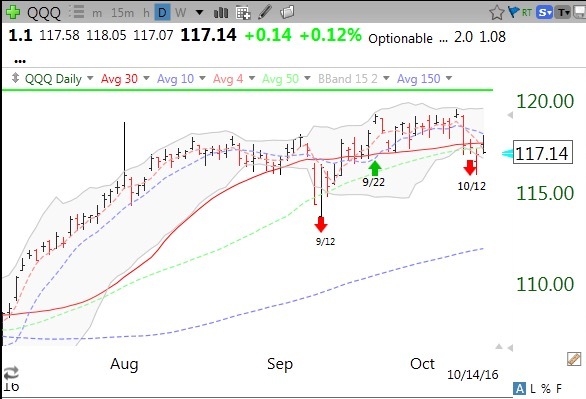 3rd day of $QQQ short term up-trend, buying $TQQQ, $WB coming back? I am slowly accumulating the 3X bullish QQQ ETF. this leveraged ETF strives to move three times as much as the QQQ. So far this week QQQ is up +1.4% and TQQQ is up +3.9%. Note–TQQQ also declines 3X as much as QQQ! 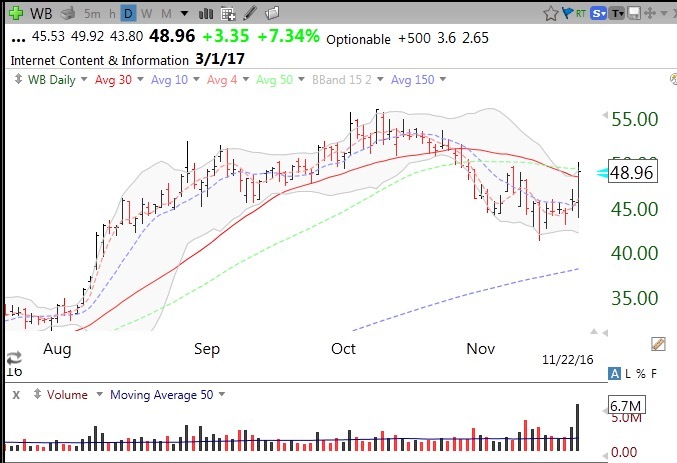 WB, a strong performer since its GLB last MAY, bounced up on Tuesday with its highest daily volume in months. 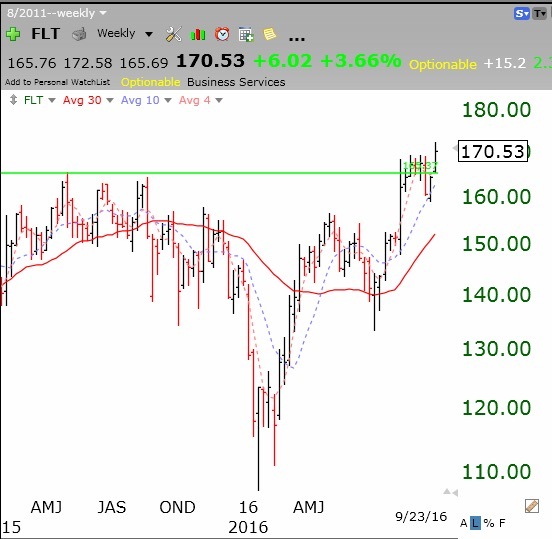 This may mark the resumption of its strong up-trend after its recent consolidation. The DIA, SPY and QQQ index ETFs are all above their 10 week averages again! Stocks are breaking out everywhere. But how to ride them to big proftis? 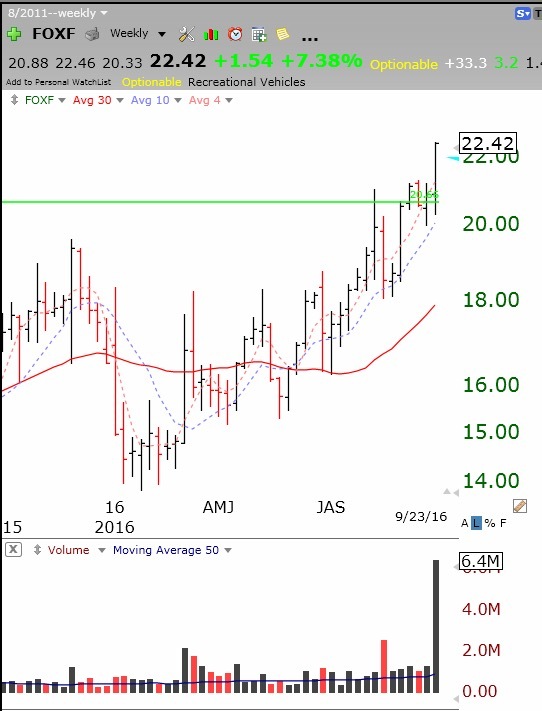 If you are like me, you often hop on a growth stock, only to sell out prematurely on weakness that you spotted on a daily chart, and the stock continues to climb much higher without you. The great gurus I follow say that the key to making big money trading is that when the rare pick starts to really work out, stay with it until it shows genuine signs of weakening. Jesse Livermore, the consummate trader, would often say that he hated to lose his position in a rising stock because he had sold out too quickly. In this new day of instant financial data feeds, I suspect one of the enemies of staying with a good stock (at least for swing traders) is focusing on charts with daily and shorter time periods to signal an exit. 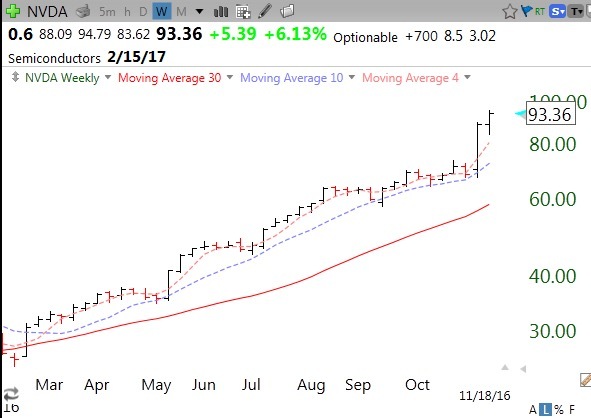 I am told that the great William ONeil, founder of IBD, used only weekly charts because they more clearly revealed to him the meaningful stock trends. If I checked my blood pressure or cholesterol daily or hourly, I suspect I might see a lot of noise and volatility that would make it harder to obtain a valid assessment of my longer term status. As a solution to this problem, I have found it very helpful to focus on weekly charts using three simple moving averages: 4wk, 10wk and 30wk. 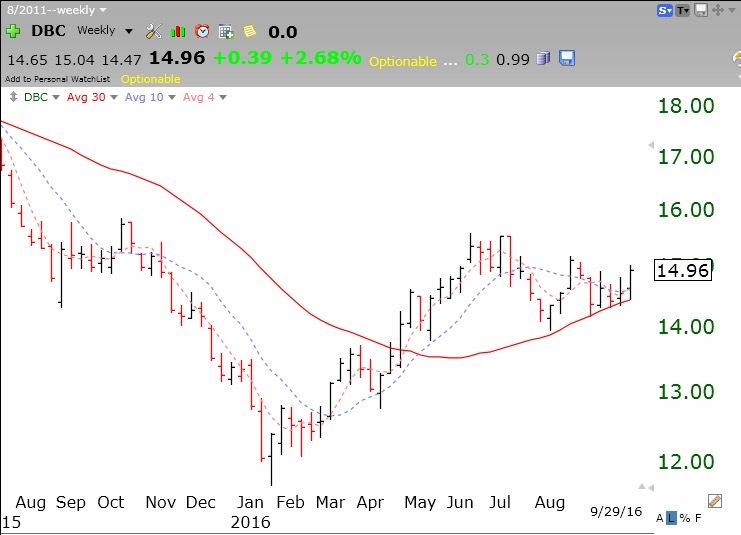 An advancing growth stock will have a pattern of the 4wk>10wk>30wk for long periods of time, in addition to being near an all-time high. During a strong advance the stock will go many weeks without ever closing below its 4wk average. Once the stock closes below its 4wk it is a potential sign of weakening at which point I might raise my stops or sell a little. A weekly close below the 10week is a call for me to exit my position immediately. Growth stocks should not close the week below their 10 week average. A weekly chart is worth a 1,000 words, so it will be easier to demonstrate this strategy with an example. NTES showed the 4>10>30 pattern from June, 2016 through November, or for about 21 weeks (4wk=red dotted line, 10wk=blue dotted, 3o wk=red solid). During that time the stock rose over 40%. During this period, NTES closed the week below its 4wk average only 3 times. 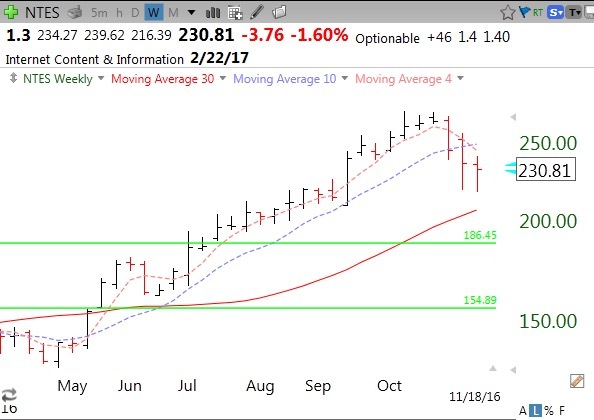 I say closed the week because a stock often trades intraweek below its 4wk average only to find support and close the week back above it. This strategy therefore works well for part-time traders like me who are able to review their stocks over the weekend or near Friday’s close. I am looking for weekly closes below the 4wk after several weeks of closing above it and for any close below the 10 wk average. In early November, NTES closed below its 4wk and then its 10week, a clear signal for me to exit (if I had owned it). Note that NTES is still in a Stage 2 advance, above its rising 30 week average, and I would consider purchasing it with a weekly close back above the 10 week average. I often tell my students not to take what I teach them on faith, but to test everything for themselves. Go out and look at the weekly charts of stocks you are trading and see if this method could have helped you. I have too many times been prematurely shaken out of a stock by focusing on its daily movements, only to see that a glance at its weekly chart could have given me the confidence to ride it higher. This method slows down my selling. I described this strategy in greater detail in a 2012 speech to the Houston Worden TC2000 Users group. A link to the archived webinar appears here and to the right of this page. 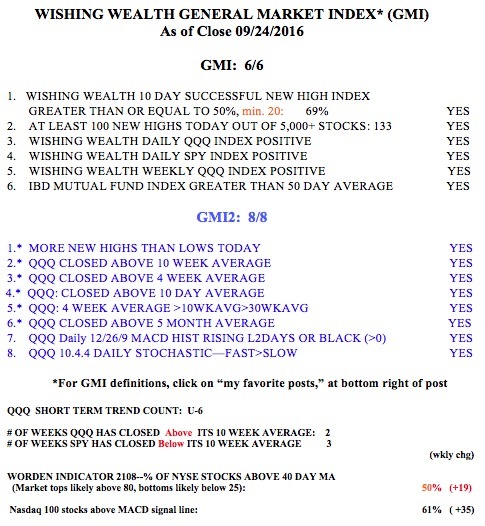 Meanwhile the GMI is back to 6 (of 6) and the QQQ short term trend is now up (U-1). I am mainly in cash in my trading accounts but holding a small position in SQQQ. If the short term down-trend continues a few more days I will add more SQQQ (the inverse 3x leveraged bearish QQQ ETF). The T2108 is at 31% and would have to fall closer to 10% to suggest a very over-sold market where significant declines end. The 10.4 daily stochastic is at 25, low, but still not in extremely oversold territory. 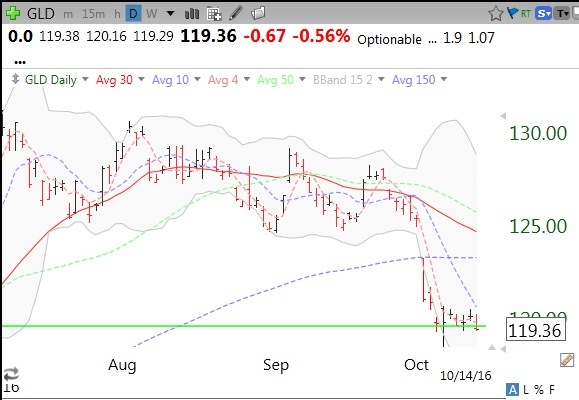 And the QQQ has just had an oversold bounce from its lower 15.2 Bollinger Band but it looks like this support level could fail to hold. The daily 12/26/9 MACD histograms are negative and declining, showing downward momentum. The GMI signal recently flashed Red, but this signal has recently coincided with short term bottoms rather than tops. Time for me to be extra careful and to conserve cash while Mr. Market makes up his mind which direction to go. 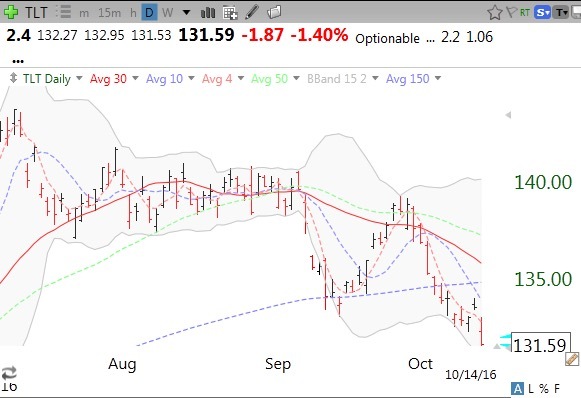 A major factor behind the weakening of the indexes is falling long term government bonds, representing higher interest rates and leading to lower gold prices. 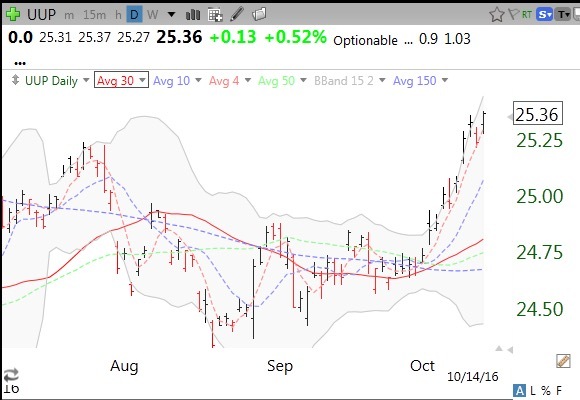 I follow the 20+ year government bond ETF, TLT, as an indicator of how bond traders feel about long term interest rates. 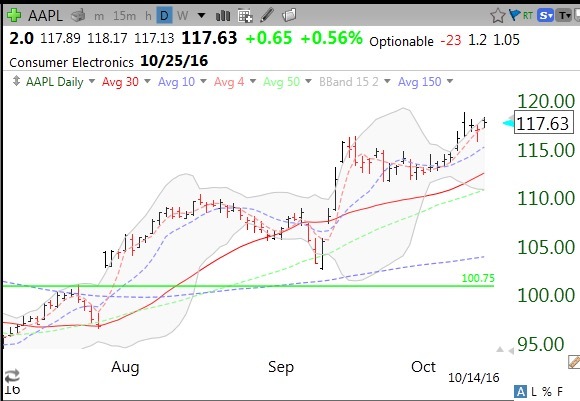 TLT is in a swoon, leading to a higher dollar and lower gold prices. And the dollar rises, as shown by UUP. 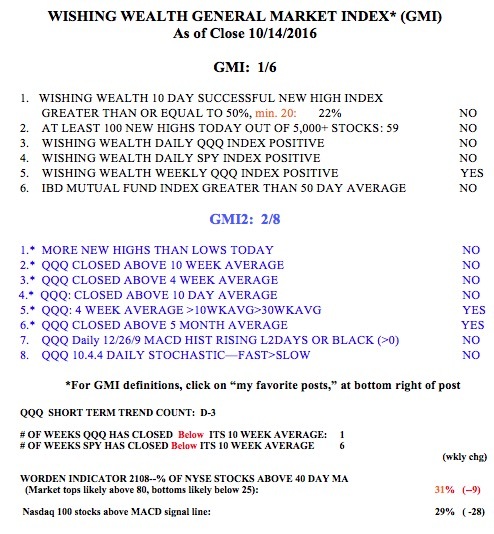 The GMI table below shows that the QQQ has just closed the week below its critical 10 week average while the SPY has done so for 6 straight weeks. Will there be a Halloween rally? With the p/c ratio=1.10 the market may bounce again on Friday. I have been buying DBC, the commodity tracking index ETF. This weekly chart is showing a new Stage II up-trend. I will hold DBC as long as it holds its 30 week average (red line). 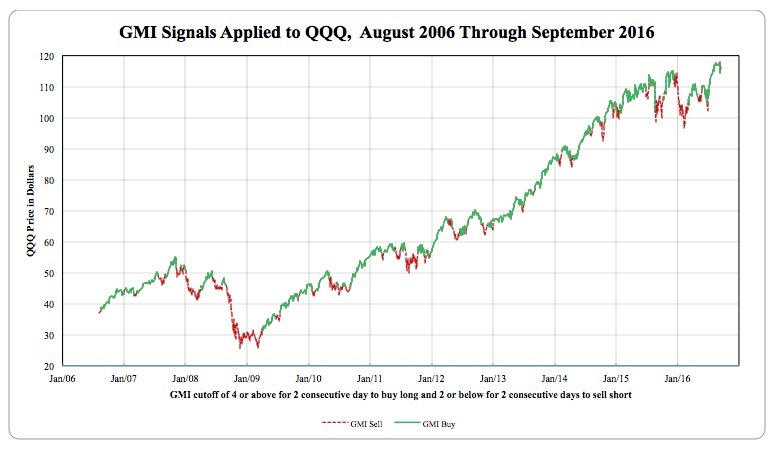 Below is a plot of the QQQ during periods when the GMI was on a Sell (red) or Buy (green) signal. Decide for yourself if this signal would have helped you stay out of bad markets, as it did for me. The GMI signals are rather conservative because the GMI tends to turn green well after the bottom of a major decline and a new up-trend has become firmly established. It also tends to turn red well after market tops. Such is the nature of trend following indicators! A plot of the shorter time period, from 2014-2016, shows more clearly that while the GMI is red during longer declines of the QQQ, it has had a number of times when it turned red right at the bottom of a very brief decline. I therefore do not necessarily exit all positions when the GMI flashes a “Sell” signal but look at additional indicators for confirmation. 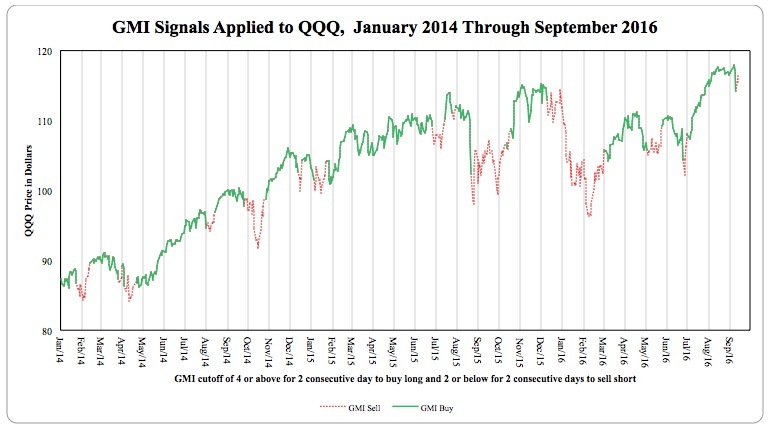 I am therefore changing the GMI signals from Buy/Sell to Green/Red. Green signifies to me that conditions favor being in stocks, while Red means the opposite and that extreme caution is needed. Speaking of short declines, the GMI turned Green at last Thursday’s close after being Red for just 8 days. As noted in the charts above, the GMI turns Red after registering 2 consecutive days below 3 and turns Green after 2 consecutive days above 3. All of the indicators measured by the GMI and GMI-2 are currently positive. 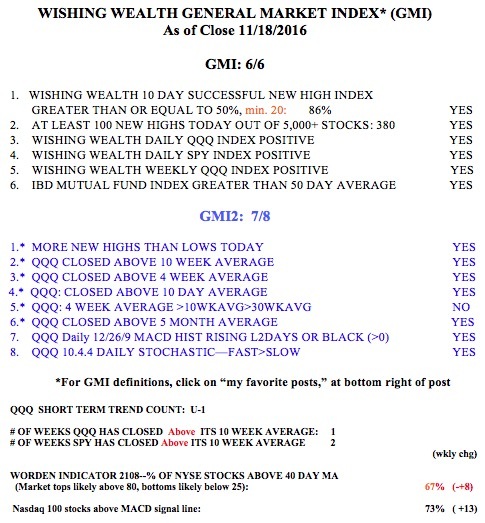 In addition, Friday was the 6th day of the new QQQ short term up-trend, which is assessed differently than the GMI signals. Note that the SPY is still (for 3 weeks) below its critical 10 week average. FOXF had a GLB on its highest weekly volume since it came public in 2013. FOXF is being added to an index ETF. FLT also had a GLB last week.